If you have ever struggled with confidence then this course is for you! If you have never had confidence or held yourself back because of fear or self-doubt then this course is a must. Wondering why you don't get promoted or are living a life that seems lackluster? Confidence is the one thing that changes everything! For years I had no idea that everyone struggles with confidence. Confidence is not something you are born with it is something that you create. How you hold yourself, care for yourself, speak to yourself, and allow others to speak to you all come into play and you are in charge of all of it! Having dealt with life's challenges from growing up poor and having a scarcity mindset, to being cheated on, to getting divorced and most recently being fired, I have learned tough times will come for us and it is up to us to activate our blueprint to create confidence when ours is in the gutter. We can't control what happens to us however we can control how we respond. I want you to be able to respond with confidence just like I do now. I have a tremendous amount of experience doing this and it is my privilege to share how to do it with you now. After being fired I wrote and self-published my first book Confidence Creator and that was one of the scariest things I have ever done. I was petrified because I had never written a book before. The act of doing it has allowed my confidence to sky rocket to heights I didn't know existed previously. Launching this course was another scary moment for me as I had never done it before. Every time I step into the role of beginner, fear begins to creep in and I use my blueprint to build confidence to overcome the fear every time. When I do this, my confidence increases and so will yours! I can't wait to answer your questions, hear your feedback and teach you to create your own confidence so you can reach your potential and live the life you have been dreaming about. In every moment we are either building our confidence or chipping away at it. The act of enrolling now is an investment in you and YOU are worth it. Change happens through action not accident. Let's go! I can't wait for you to become your own Confidence Creator. Still not sure? The best feedback I can share with you is feedback from others. Click here to read what people are saying about my book on AMAZON and here to see what people are saying about working with me TESTIMONIALS. Heather Monahan is a best-selling author, keynote speaker with the Harry Walker Agency, entrepreneur and founder of Boss In Heels. Having successfully climbed the corporate ladder for nearly 20 years, Heather Monahan is one of the few women to break the glass ceiling and claim her spot in the C-suite. As a Chief Revenue Officer in Media, Heather Monahan is a Glass Ceiling Award winner, named one of the most Influential Women in Radio in 2017 and Thrive Global named her a Limit Breaking Female Founder in 2018. 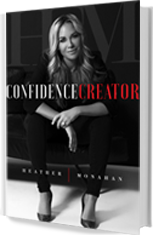 Heather’s new book Confidence Creator shot to #1 on Amazon’s Business Biographies and Business Motivation list the first week it debuted on Amazon. Heather is a confidence expert and is currently working with Fortune 500 companies, Universities and professional sports to develop confidence in the workplace, classroom and on the court. She’s also a member of Florida International University’s Advisory Council to further serve as a mentor and leader in the South Florida Community. What you have the courage to ask for is what you will get! Choose people and places that spark joy in you! How we speak about ourselves is how others will speak about us too. The course starts now and never ends! It is a completely self-paced online course - you decide when you start and when you finish. However, this course is designed as a 30-day Confidence Creation course which delivers results in 30 days when you stick to the timeline. It's important to have access forever because confidence will inevitably dip again and you will have your reboot accessible to you whenever you need it. The best investment you will ever make is the one you make in yourself.